Hi there! The scientific review Icarus releases an issue dedicated to New Horizons, which made a fly-by of the system of Pluto-Charon in July 2015. Now all the data have been transmitted to Earth. This is the opportunity for me to present you one of the new papers, entitled Charon tectonics, by Ross Beyer et al. This papers presents evidences of an active tectonic youth of Charon, and probably a former subsurface ocean, which is now frozen. Charon has been discovered in 1978, as the first known satellite of Pluto. It actually appeared that Charon is massive enough, so that Pluto-Charon should be considered as a binary system, which orbits around a common barycenter. Moreover, the gravitational interactions (one call them tidal interactions) between these two bodies are so strong that they rotate synchronously with their mutual orbit. This means that they always show the same face to each other. The recent flyby of the space mission New Horizons gave us several details on Charon, the paper I present here addresses some of them, more specifically linked to the features observed at the surface of Charon, which are linked to a past geophysical activity. Let us now speak a little about planetary tectonics. The tectonics is the process that controls the shaping of the surface of the Earth. It is responsible for the apparition of mountains, for earthquakes, for the continental drifts (plate tectonics). Tectonics does not appear only on Earth, this is why we can speak of planetary tectonics. Tectonics results from the heating of a planetary body, and the loss of this heat. This heat is responsible for melting of some elements, differentiation of the planet, and thus activity. A spectacular example in the Solar System is the intense volcanic activity of Io. This satellite of Jupiter is intensively heated by the tidal interaction with its parent planet. Another example is the geysers on the satellite of Saturn Enceladus. The satellites of Uranus Ariel and Miranda present interesting features as well. Some of the definitions I present above have been borrowed from the official nomenclature of the International Astronomical Union. Such a nomenclature has been established to name the planetary features actually observed. Chasma: A deep, elongated, steep-sided depression. The plural is chasmata. Scarp: An escarpment, i.e. a vertical feature which separates two zones of different elevation. Macula: A dark spot, which may be irregular. The plural is maculae. Planum: A plateau, or a high plain. Elastic thickness: This is not a topographical feature. This is the thickness that would have the crust if it were fully elastic in showing the features actually observed. This quantity helps to characterize the crust from the observation of the surface. and the Venetia Burney Student Dust Counter SDC, which studied the dust in the system of Pluto. This instrument was part of a New Horizons Education and Public Outreach project, it was designed and built by students. It was named after Venetia Burney, who proposed the name of Pluto after its discovery. She was 11 then. The 250-km-wide Burney Crater, on Pluto, is named after her. The paper I present today use mainly LORRI and LEISA data, LEISA being an infrared detector of Ralph (not to be confused with LESIA, which is a planetary lab of Paris Observatory). This mission did not permit a global high-resolution mapping of Charon, since New Horizons did not orbit in the Pluto system. So, the highest resolution images we dispose of are limited to one hemisphere, and the way to analyze them depends on the varying Solar insolation angle. A scarp, a mountain, a crater… will appear differently if enlightened from the zenith or from the horizon. This paper represents the main surface features that can be seen, before discussing their origin. Craters give us the chronology of the tectonics. Tectonic activity tends to melt the surface, renew it, and relax the crater basins, which should then be barely visible. The fact that many craters can be seen means a very old surface. This also means that the other features are even older, i.e. they were created some 4 Gyr ago. Let us concentrate now on the equatorial belt. The two main features are Serenity Chasma, which is 40-50 km wide and over 200 km long, and Mandjet Chasma, which is 30 km wide and at least 450 km long. These two structures have a depth of typically 5-7 km. These chasmata suggest an elastic thickness of 2.5 km. Moreover, the structures indicate that Charon experienced a radial extension, which could be due to the freezing of a global surface ocean. 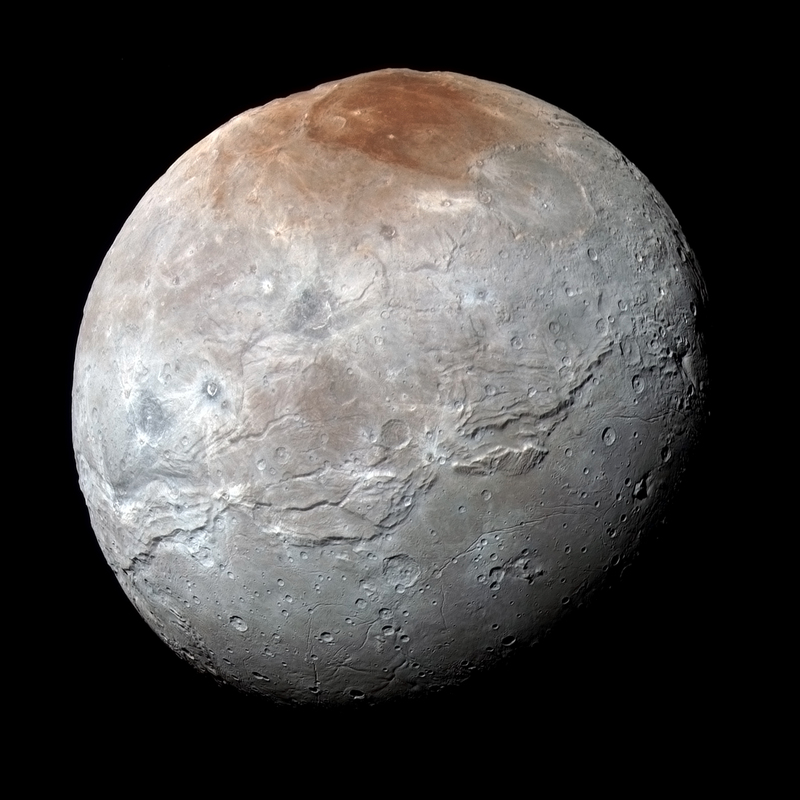 So, in its early ages, Charon has had a global subsurface ocean, which is now frozen. Creating a subsurface ocean requires some heating. The system Pluto-Charon could originate from the destruction of a progenitor by an impact, which would have induced intense heating. Moreover, this heating has probably been assisted by the tidal heating of Charon by Pluto. The discovery of these features gives us another signature of the early ages of the Solar System, and would surely contribute to the global understanding of the formation of planetary systems. That’s all for today! I hope you liked it. As usual, you are free to comment. You can also subscribe to the RSS feed, and follow me on Twitter. Hi there! Today’s post deals with the following problem: Imagine you have a planetary body, in the Solar System, which orbits either the Sun or a massive planet. This body has its own rotation. And, for some reason, for instance a mass anomaly, its orientation changes dramatically. This is a pretty complex problem when the body is not rigid, i.e. its shape is not constant. This problem is addressed in A numerical method for reorientation of rotating tidally deformed visco-elastic bodies, by a Dutch team of the University of Delft, composed of Haiynag Hu, Wouter van der Wal, and Bert Vermeersen. This paper has recently been published in Journal of Geophysical Research: Planets. The main difficulty of the problem comes from the fact that the involved body is not rigid, i.e. its shape might change. Beside a catastrophic event like an impact, 2 physical effects are likely to shape a planetary body: its rotation, and the tides. The deformation due to the rotation is easy to understand. Imagine a body which rotates about one axis. The centrifugal force will tend to repel the masses, especially at the equator, creating a symmetric polar flattening. The tides are the differential gravitational attraction created by a massive object, on every mass element of the involved body. Not only that would result in a loss of energy because of the internal frictions created by the tides, but that would also alter its shape. If the body has a rotation rate which has no obvious connection with its orbital rate around its parent body, which would be the Sun for a planet, or a planet for a satellite, then the tidal deformation essentially results in an oscillatory, quasi-periodic variation of the shape. However, if the body has a rotation which is synchronous with its orbit, as it is the case for many planetary satellites (the Moon shows us always the same face), then the tides would raise a permanent equatorial bulge, pointing to the massive perturber. Consequently, the satellite would be triaxial. When there is no remnant deformation, for instance due to a mass anomaly, then the shape of the satellite is rendered by the so-called hydrostatic equilibrium. The intensity of the deformation is given by Love numbers, the h number being related to the shape, and the k number to the gravity field. The most commonly used is the second-order Love number k2, which is the lowest-order relevant Love number. It permits to render the triaxiality of a synchronous body. All this means that, when a satellite or a planet undergoes a brutal reorientation, then its shape is altered. Modeling this transition is challenging. Several Solar System bodies are thought to have undergone Polar Wander in the past. The reason for that is, when a mass anomaly is created, for instance due to a collision, or because of the liquefaction of water ice in the body, then the shape of the body, i.e. its mass balance, does not match with its rotation and the undergone tides anymore. The natural response is then a reorientation, which is accompanied by reshaping, since the body is not rigid. Polar Wander has been proposed to explain the retrograde rotation of Venus. Modeling the dynamics of True Polar Wander for a visco-elastic body is a true challenge, one of the issues being: how do you model the evolution of the orientation and of the shape simultaneously? the equilibrium approximation: the idea is here to not try to simulate the process of True Polar Wander, but only its outcome. This would assume that the reorientation is now finished, and the shape is relaxed. But we cannot be sure that the bodies we observe are in this new equilibrium state. The study I present here is the first paper of a series, which aims at going beyond these approximations, to criticize their validity, and to be more realistic on the evolution of the involved Solar System bodies. Before presenting its results, I will briefly present the Finite Elements Method (FEM). In such a problem, you have to model both the orientation of the rotation axis of the body, which depends on the time, and the distribution of masses in the body, which are interconnected to each others and are ruled by the centrifugal and tidal forces. This would result in a time-dependent tensor of inertia. This is basically a 3×3 matrix, which contains all the information on the mass repartition. For that, a common way is to split the body into finite elements, i.e. split its volume into small volume elements, and propagate the deformations from one to another. Proceeding this way is far from easy, since it is very time-consuming, and the accuracy is a true issue. It is tempting to reduce the size of the volume elements to improve the accuracy, which should work… until they are too small and generate too many numerical errors. Moreover, smaller elements means more elements, and a longer computation time… In this study, the authors borrow the finite elements solver from a commercial software. Algorithm 3, which models the response to a mass anomaly. the quasi-fluid approximation is reliable only when the body is close to its final state, i.e. equilibrium rotation and relaxed shape. More results are to be expected, since the authors announce to be working on the effects of lateral heterogeneity on True Polar Wander. The study, made available by the authors on ResearchGate, thanks to them for sharing! The web page of Haiynag Hu. The web page of Wouter van der Wal. The webpage of Bert Vermeersen. That’s all for today. Please feel free to comment, to follow the Planetary Mechanics Blog on Twitter (@planetmechanix), and to subscribe to the RSS feed. Hi there! Today’s post is a pretty much different than usual. I will present you a mathematical analysis of planetary features. More precisely, a paper investigating the fractal structure of the surface of Mars. This is a paper entitled Mars topography investigated through the wavelet method: A multidimensional study of its fractal structure, by Adrien Deliège, Thomas Kleyntssens and Samuel Nicolay, which has been recently published in Planetary and Space Science. This study has been conducted at the University of Liège (Belgium). The Mars Orbiter Laser Altimeter (MOLA), as instrument of Mars Global Surveyor, provided us a very accurate map of the whole surface of Mars, which is far from boring. It has for instance an hemispheric asymmetry, the Northern hemispheric being composed of pretty flat, new terrains, which the Southern one is very cratered (several thousands of craters). The northern new terrains are made of lava, which is a fingerprint of past geophysical activity. Moreover, Mars has two icy polar caps. Olympus Mons, which is the highest known mountain in the Solar System. This is a former volcano, which rises 22 km above the surrounding volcanic plains. The Tharsis region, which contains many volcanoes. Hellas Planitia, which is a huge impact basin (diameter: 2300 km, depth: 7 km), located in the Southern hemisphere. You can find below an annotated map, please click! and the radio-science, which measured the gravity field of the planet. Mars Global Surveyor was of great help to prepare the further missions. It allowed in particular to identify landing sites for rovers. The rich topography of Mars has encouraged many scientists to characterize it with a fractal structure. A fractal is a mathematical set that exhibits a repeating pattern displayed at every scale, see the following figure, which shows the well-known Mandelbrot set. The Mandelbrot set, plotted by myself after an inspiration from Rosetta Code. The zoom on the right shows the same structure than on the left, with a larger scale. It is tempting to quantify the “fractality” of such a set. A convenient indicator is the Hausdorff dimension, which is an extension of the dimension of a space. A line is a space of dimension 1, a plane is of dimension 2, and a volume of dimension 3. 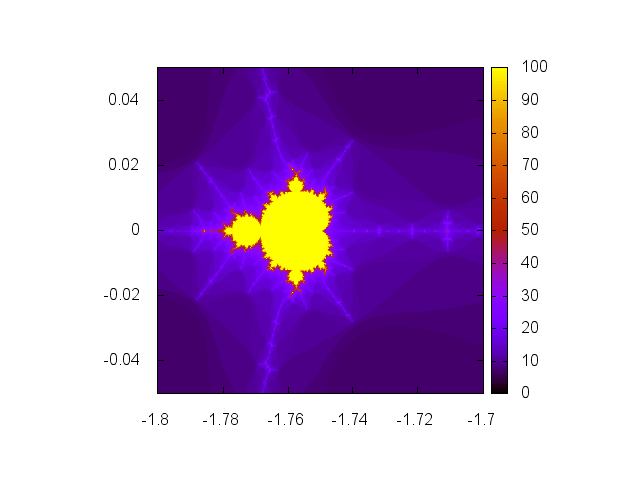 Now, if you look at the Mandelbrot set, for instance, its contour is a line of infinite length (actually depending on the resolution of the plot), which tends to fill the plane, but does not fill it entirely. So, it makes sense that its dimension should be a real number larger than 1 and smaller than 2. The Hausdorff dimension quantifies how a fractal set fills the space. The Hausdorff dimension of the Mandelbrot set is 2, the one of the coastline of Great-Britain is 1.25, and the one of the coastline of Norway is 1.52. For a natural object, things are not necessarily that easy, in the sense that some parts of the objects could look like a fractal, and some not, or look like another fractal. Then the object is said multifractal. The Hausdorff dimension is not the only possible measure of a fractal object. In the paper I present today, the authors use the Hölder exponent, which represents how continuous the function is. Here, the function is the height of a terrain, it depends on its coordinates, i.e. longitude and latitude, on the surface of Mars. The Hölder exponent is usually more appropriate for sets of numerical data. The wavelet transform is a mathematical transform, which aims at measuring the periodicity of a phenomenon, and gives the amplitude of a periodic contribution, at a given period. In our case, the idea is to measure periodic patterns in the spatial evolution of the height of the surface of Mars. For that, the authors use more specifically the wavelet leaders methods, which will in particular give them the Hölder exponent, and tell them how (mono)fractal / multifractal the topography of Mars is. The surface of Mars is monofractal if you look at it at scales smaller than 15 km. It is multifractal for scales larger than 60 km (the authors considered that the range 15-60 km is a transtition zone). The “monofractality” is better in longitude than in latitude. This could be due to the hemispherical asymmetry of Mars, to the polar caps, and / or to the fact that the representation surface is just a planar projection, which necessarily alters it. Some features can be detected from the variations of the Hölder exponent, especially the plains. However, this technique seems to fail for the volcanoes. The study. You can also find a poster version here. The webpage of Thomas Kleyntssens. The webpage of Samuel Nicolay. That’s it for today! I hope you enjoyed this post. I particularly like the idea to give a mathematical representation of a natural object. Please feel free to comment! You can also subscribe to the Twitter @planetmechanix and to the RSS feed.